250 Palestinian Refugee Children receive laptops in the Amari Boys School! Today marks the end of the first-ever XO Summer Camp in the Amari Boys School in the West Bank city of Ramallah. Following the teacher training last week, children came school this week to get familiarized with XOs well before the start of their new school year. The schoolteachers did an amazing job relaying their new skills with the XO to the kids along with help from our amazing volunteers at PaleXO! The children spent three days learning and exploring activities on their XOs both at home and in the classroom, and took to mastering the programs even faster than their teachers! Kids loved connecting and sharing with each other through the Mesh Network and had a blast playing with the various activities, even learning how to type their names in Write was a joyful game. When showing children the Record activity, featuring a camera, kids were thrilled; unanimously across classrooms kids began to break out dancing in their seats for the camera! They were so excited to begin; all the students began lining up outside their school as early as 7am each morning to start their day of fun and learning. This was a great opportunity to make learning fun and stimulate school attendance, even in the summer time! As a great finale to the summer children’s parents were invited to attend today’s session in order to maximize community participation in the OLPC project. Children were excited to show their parents what they had learned, and the principal hosted a brief orientation session in order to explain the importance of the project to the future of their children’s education. Next week we begin our XO Summer Camp at the Amari Girls’ School! What a terrific story. Education is the key to peace in the region. Investing in “real” education for these children instead of brainwashing them in a culture of hate will do more to advance peace and prosperity than all of the other efforts combined. why should we have more access to these things than them? i’m Ferly(Aneka Computer) we’re in the bussiness whose selling n service a notebook computer in Indonesia..how we can sell this product in indonesia..?where we can buy in Indonesia? we waiting for your info..
called Townshend.I think this is a wonderful idea. I had never been on the computer nor learned to use one until a year ago february 2008! I was more afraid that I would do something wrong and break it or do something dumb to ruin it,than to try and use one. Everyone told me just get on it and it’s easy to use! Well,I had my girlfriend sign me up to facebook as I had been hearing alot about it. Well a year and a half later and I have over 100 friends & family on my page and I wonder why I hadn’t tried it before.LOL!What a darn dummy! Well i can honestly say I am not a total computer Illiterate anymore and I wonder HOW I could have been so dumb to not learn. I hear people my age and older,some alot younger say the same things I used to say.and I tell them the same things my daughter and sons told me. Just try it! I really don’t know how I got along without one now.What a exciting world we live in.The technology is insane to me and I learn something new every day.Each and every day!Anyways I have custody of my 7 year old grandson and he is already learning to use one in school and would very much love his own computer that’s for SURE! None of these kids have t heir own laptops. Most of the people are pretty poor like me. That’s what I was getting at! I just love the fact that these poor kids in Africa and India etc. etc . are getting these Laptops but I really think it should start at home.Boy do I wish I could buy him (My GS) one. At 35.00 no less.That would be absolutely wondeful as he is already having a hard time w/reading,but he excells in math.I so disagree with the other comment. from concerned. There are parental controls and other stuff.The possibilities are endless and in these times everyone will have to learn or be left out in the cold,you are going to need these skills to exist in these times. My husband was recently diagnosed w/pancreatic cancer and underwent what was called the whipple surgery,a very long 10 hr. surgery in bay state hospital in springfield Mass. and had I not had the computer I wouldn’t have known a thing about what was going on!! !He went to the Drs. in May, and he had the surgery a week later on the 19th. He is on the road to recovery now (we pray),and after such pain I am so proud of him.However he can no longer work as a carpenter like he was,he has lost 46 pounds.I don’t think he coud carry those 2x4s up on a roof anymore! I am 53 years old and am disabled also! I can hardly walk! I would so love to get the kids in his class one of these computers,never mind his school.There are probably ten kids in his grade!Nobody can even afford a computer here never mind one for their 7 yr. old. So i think the program is great,but why I ask is it not being done in this country!???? ?Thanks for your time and keep up the great work.Sincerely Lisa M. Johnson A POOR person in these United States!!! 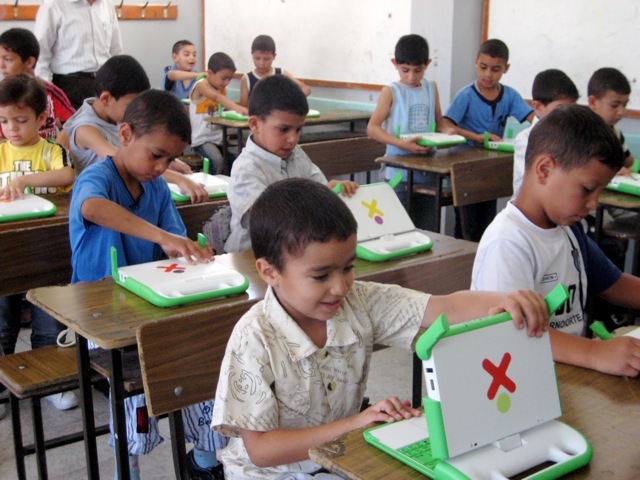 The OLPC project in Gaza and West Bank was not done unilaterally OLPC but in partnership with local educational authorities including the Ministry of Education, the Palestinian Education Initiative and UNRWA. The introduction of the laptops to the teachers, students and families was done through them. Likewise the content and activities on the laptops was selected locally; not by OLPC. Fundamentally the local context and environment defines the specifics of the project. One laptop per child has been deemed to have a vital role in the development in their children’s learning. 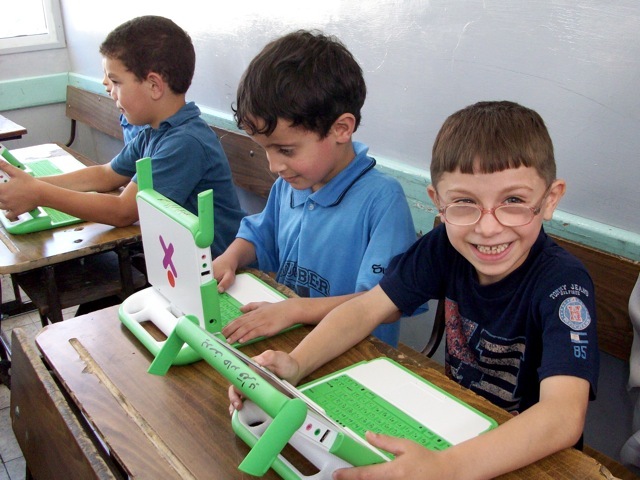 One of OLPC’s overarching consideration in any of the partnerships, is that the local entity by prepared to completely own, implement and grow the project. OLPC’s role is to share the experience, learn from it and connect each projects; reflecting and improving implementation has we go. As SJ suggests if there is research or information that either our partners or we have missed, we always look to the network of supporters and skeptics to help us grow. What harmful influence are you concerned with? The content on the laptops is determined entirely by local teams. In Gaza, for instance, the teachers were given some time to decide whether they thought this would be a useful project for their students or not. It was only because the teachers and residents were interested in the project – over other possible school development projects – that it was started. We are very interested in research into the sorts of issues you describe – if you have specific concerns, or new research that you think we should look at, please offer details. What is wrong with you, do you realize the harmful influence you are having on people of other culture. You are just as ignorant as colonialist children don’t need lap tops! I am sure you have received other emails like this but, really. I admire what you are trying to help but research what you are doing!